2013. By Peter Marchand. 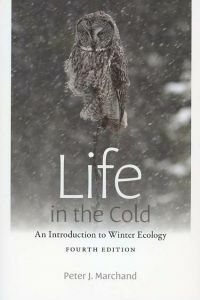 The new updated and expanded fourth edition of the author's seminal book on winter ecology. This book offers a comprehensive picture of the interactions of plants and animals--including humans--with their cold-weather environment. This new edition also includes a new chapter on climate change and its effects on plants and animals wintering in the North. Softcover. 306 pp.